Your phone is a great place to keep some anxiety tools. Many of us carry our phones around everywhere so it is always to hand. But there are so many apps out there, how do you know which ones you should have? Chris to the rescue. I have downloaded 67 of them, played about with them and documented me findings below. Some are great. Others are less good. I will give you my honest opinion on each of them. Headspace is one of the most famous mental health apps out there. It offers guided meditations starting with their free "take 10" series which features a daily 10-minute meditation for ten days. After that, you need to pay the subscription fee: £7.95 per month. Or you can take the yearly plan for £60. 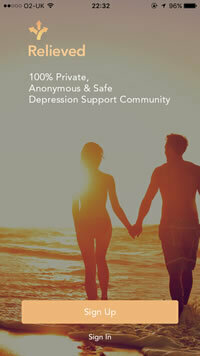 Members of Anxiety UK get a year's subscription for free. Once you have completed the foundation course, which is 30 meditations, you can then pick various "packs". 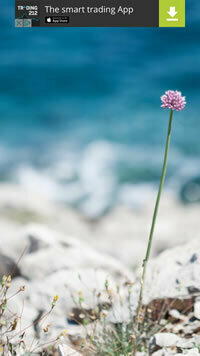 These are a series of meditations on different topics such as anxiety, depression and focus. At the time of writing, the Headspace app was broken and crashed every time I tried to launch it on my phone. 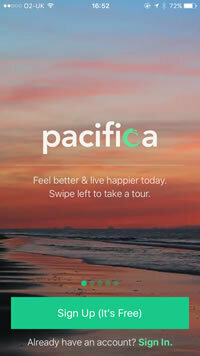 Pacifica is a toolset to help boost your mood. It allows you to track things like your sleep and exercise, and set goals. You can customise the options or even add in your own goals, and set daily reminders. The actions section gives you ideas of things to do including engaging in the community, following daily habits and journaling your thoughts. The thought reframing tool is useful. You can put in a negative thought, such as "I am a loser", and it will then get you to identify the thought errors. You can tap on the word and label them as "judgmental", for example. You can then swap out the words for positive language. There is a lot of functionality here, so it can be a little confusing to use. This is where the guided paths come in. It is best to start with these to avoid becoming overwhelmed. 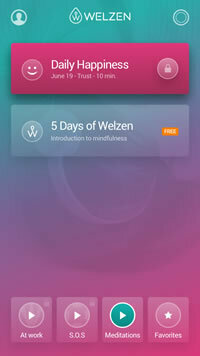 A series of guided audio meditations are also bundled into the app. Most of which you will need to subscribe to gain access to. This is currently £4.49 per month, with a 50% discount for paying for the year upfront. 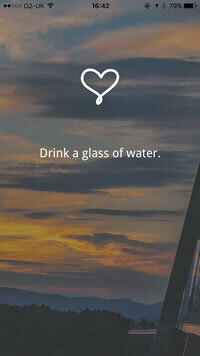 This simple app offers you a breathing exercise and a meditation exercise. It is very quick and easy to use. However, those are the only features it provides. If you want the full version, you can upgrade in the app for £2.99. This app contains a simple breathing exercise. While the interface looks like it is from the 80s, it is simple and easy to use. 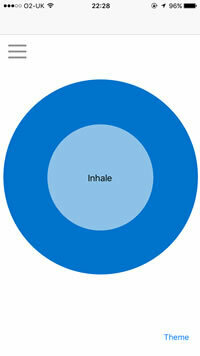 The exercise provides clear visual indicators of when you should be breathing in and out. It tracks your mood at the start and end of the session and can show you the results over time on a graph. This app is a tool for journaling your anxiety. You can add events and notes which are then presented on a timeline. There is no free version: you have to go straight to the paid version, which is priced at £1.49. 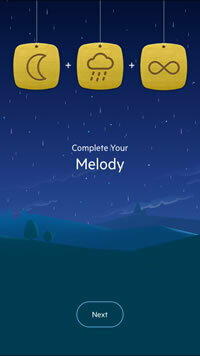 This app contains a variety of sounds you can play to relax you. These include rain, birds, a campfire and even some rather un-relaxing sounds such as a thunderstorm and a vacuum. You can stack the sounds on top of each other to create your perfect melody. To get access to everything you need the pro subscription, priced at $9.99 per month. This also removes the adverts from the bottom of the app. This app gives you deep breathing exercises. There is no free version. The paid version costs £3.99. This app is targeted at young adults. It provides a variety of tools including information about anxiety, a self-test, guided breathing and visualisation audio. This app claims to track your mood. However, it is not clear whether it is still maintained as I have never been able to get into the app (you get stuck in the login screen) and my iPhone warns me that the app will not work with future versions of iOS. 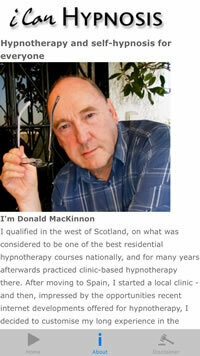 This app is published by a Scottish hypnotherapist named Donald MacKinnon. You know this because the app contains a large picture of his face looking serious and an introduction from him. 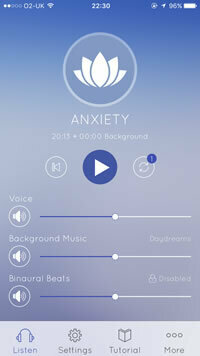 It offers guided audio for self-hypnosis. It's free, but if you want to remove the adverts and skip the introduction, you can upgrade for £1.49. It's not entirely clear what this app is. You begin by selecting the problem you would like to address. For example, you can select "anxiety" and then a sub-topic such as "fear of fear". At some point, you get pitched for their "RDH treatment" which was priced at £6.99 and I think was a set of guided relaxation exercises. You have to register to get this far. This is a simple app for tracking your mood. 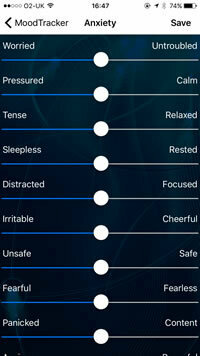 From the home screen, you can select "good", "okay" or "bad" and are then encouraged to add further tags such as "depressed", "tired" or "doubtful". You can also add a note. You can then see a log of your mood and a weekly report. 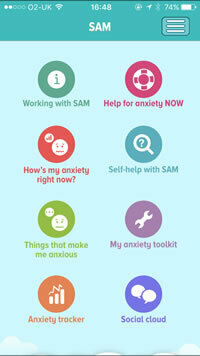 This app is published by the University of West England and offers informational slides on anxiety. It also allows you to measure your level of anxiety with a test and do some breathing exercises. This app is designed to improve your mood using cognitive behavioural therapy (CBT) techniques. In practice, this involves swiping through slides of information that seem to go on and on. There is also a diary where you can add notes. This app offers tools to improve your mood and has received some media attention. These include activities to do, a mood tracker and a journal. There is no free version. The paid version costs £3.99. This app gives you a 33-point test to track how anxious you are feeling. It tracks your history so you can see how your mood changes over time. It's free, but advert supported. 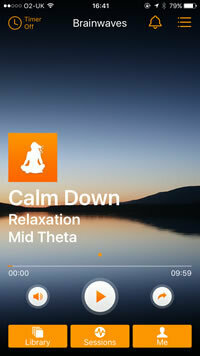 This app provides guided audio sessions for relaxation. You get the first three for free, and can then pay if you want to unlock the remaining ones: £7.99 per year or £22.99 one-time fee. This app offers Eye Movement Desensitization and Reprocessing (EMDR)-based sessions. There is no free version. The paid version costs £3.99. This app allows you to track your mood on various scales including feeling pressured, tense, rested, distracted and cheerful. You begin by selecting what you want to track: anxiety, depression, wellbeing, PSTD and other options, and the fields are then customised. It shows you your results on a graph. 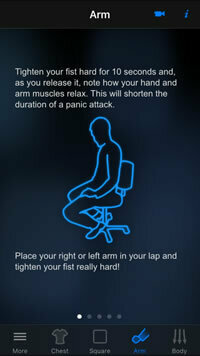 This app contains a few information slides and an arm exercise which it claims will help to relax you. If you find yourself enraptured by tensing and releasing your arm, you can upgrade to the paid app for £0.79 to get all of the exercises. This app offers a four-week programme for reducing anxiety that includes things to read, setting personal goals and a journal. There is no free version. The paid version is £3.99. 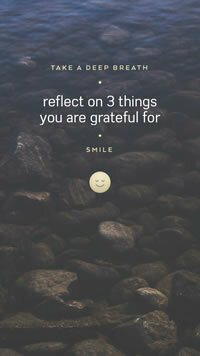 This app allows you to list your worries, gives you positive affirmations and has audio available to download. 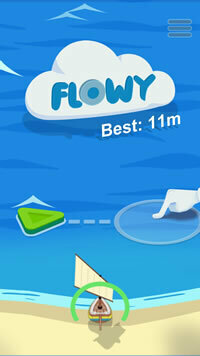 This is a game where you have to steer a boat while a cloud tells you how to breathe. It was still in beta at the time of writing. However, the idea is that it helps your breathing during panic attacks. 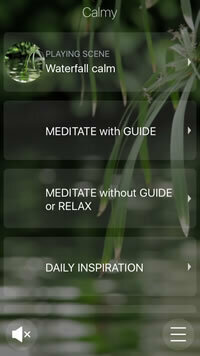 This app offers guided meditation. 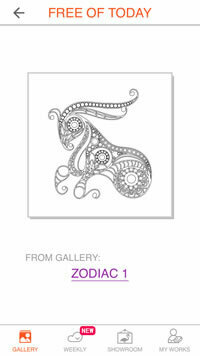 Not only does it come with a beautiful design, but recommends a different meditation each day, too. You get the first seven days free and can then unlock the rest of the content for £7.99 per month or £29.99 per year. The premium packs focus on specific topics such as anxiety, happiness and sleep. This app gives you straightforward and actionable tasks to do. You start by selecting what you want to challenge. For example, "anxiety", "depression" or general challenges. After that, it gives you quests to do such as hug yourself or drink some water. 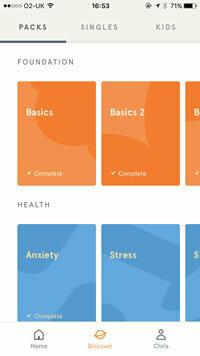 This app is designed to reduce stress and bills itself as "your personal happiness trainer". 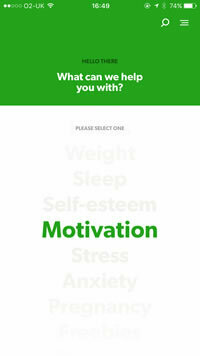 You start by filling out a questionnaire that asks you for some personal details and about your anxiety and your mood. After this, you have to register. Once you are through all of this paperwork, you have the option to set your mood to "private" or "community", allowing you to share your progress with others. Finally, you get to the content. It gives you a series of games to play. For example, one of them is an Angry Birds style game. In another, hot air balloons appear with words on them and you have to tap the positive words while avoiding the negative ones. For each of the activities, they provide a "how it works" fact sheet to explain the reasoning behind what you are doing. If you want to upgrade to Happify Plus, it's £8.99 per month or £44.88 per year. This is another self-hypnosis app. It's free, but if you want the pro version, it costs £2.99. This allows you to disable the audio instructions, enable the "hypnotic booster" (I'm not sure what this is) and gives you additional backgrounds and looping options. This app is designed to track your mood. It also gives you breathing and mindfulness exercises. This app provides live chat. You can choose between various topics including relieving anxiety, managing emotions and defeating loneliness. The app is a little confusing to use: on the chat screen, you can choose between group chats and 1-1 conversations. However, trying to select 1-1 doesn't seem to do anything. Clicking the buttons above this allows you to access chat with an active listener or you can choose a paid session with a therapist. This app is literally just some nice pictures with some quotes on the top. You can tap the screen to move onto the next quote. Occasionally it pops up a recommendation to install a mood tracker named Moodicious which is published by the same company. This app provides an adult colouring book. You get a couple of pages that you can colour in for free, or you can upgrade to the premium version to unlock most of the content. This costs $7.99 per month or $39.99 per year. The colour options allow you to pick any colour you like using a variety of interfaces. You can then click on the image to colour in that section. There is an undo button if you make a mistake. If you like your creation, you can export it or share it on various social networks. While you are colouring, there are ads at the bottom of the app. Apps also pop-up over the entire screen and when I dismissed it, I found another advert asking me to upgrade to Premium. Doing so would also remove the ads. 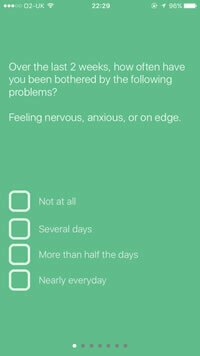 This app was created by Anxiety UK. There is no free version. The paid version costs £0.99. It has just one star in the Apps Store. I have never seen an app rated that low before. I did not buy it because who would buy an app with 1 star. But, by the look of the screenshots provided in the Apps Store, it has information on anxiety, a self-diagnosis test and some audio clips. 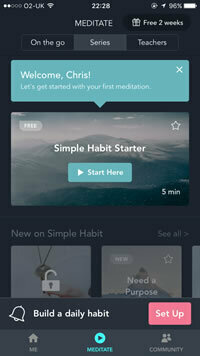 This app describes itself as a mindfulness and meditation app. It provides a new ten-minute meditation every day. It also includes a breathing exercise with an animation telling when you breathe in and out. 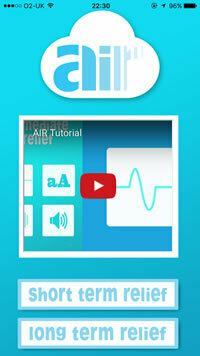 The app is easy to use, the instructions are clear and the audio is well recorded and produced. 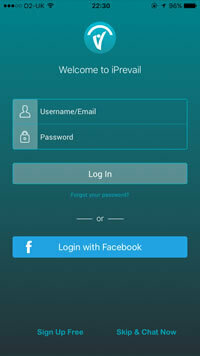 You have to register before you can use the app, signing up via Facebook or with your email address. It's integrated with Apple Health Kit to record your mindful minutes. As a free user, you get access to is five meditations. For everything else, you need to be a paid subscriber at $9.99 per month. This app begins by telling you about the different types of brainwaves; there are four, apparently. It then explains that an inappropriate brain state can cause you stress but that specially composed audio can adjust your brain state. Which is where the app comes in. It first asks you to set your goal. However, for me, the content never loaded, so I had to skip this section. I was then given the dashboard. The first suggested audio was "calm down". I played it and found ten minutes of running water and background music. The "sessions" tab gives you access to a range of other audio that you can purchase. Some of the downloads are free. This app pushes a course called iLovePanicAttacks. 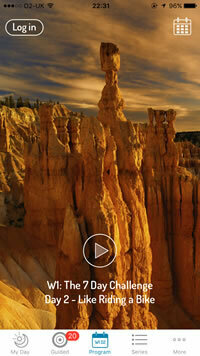 It comes with some audio and video that provides guided audio on relaxing. It looks like the app has been built using a web view (just showing web pages) as it clearly does not use native iOS features. The links and clunky and the page transitions are slow. The videos are just YouTube embeds. The audio is quite pleasant. However, the design of the app is rather off-putting for me. If you can get past that, the content is enjoyable. I could not work out how to turn the audio off. It did not stop when I exited the app, so I had to double-tap the home button and quit the app to get it to stop. Glenn Harrold is a hypnotherapist, but you could be forgiven for thinking he is a rockstar or stage magician from looking at the photo on the front of the app. 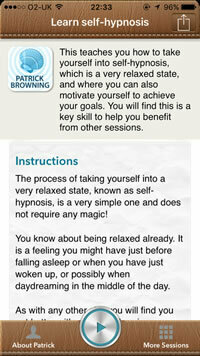 It offers two guided audio sessions: a cut-down session on overcoming anxiety and one on improving your sleep. You can then buy additional guided audio from the store for £2.99 per time. This app claims to offer "meditations for stress and anxiety powered by artificial intelligence". It starts by personalising your experience, asking for your name and age. You can then select how interested you are in mindfulness, how positive you are and how stressed you are. 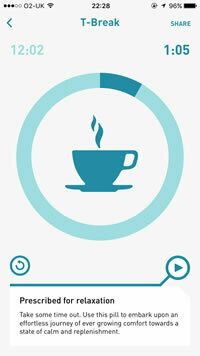 You can then set a daily time for mindfulness: after showing, brushing your teeth, exercising or eating breakfast. 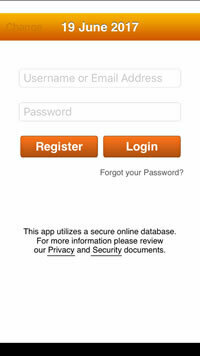 Once you have configured everything, you then need to register with your email, Facebook or Twitter. Finally, we get to the good stuff. It gives me a three-minute meditation talking about compassion. After I complete this, I am asked to rate it, leave feedback, then input my mood. You get one meditation per day for free. For unlimited access, you need to subscribe to premium. This costs $7.99 per month. Or, if you know you are going to love it, you can buy lifetime access for £399.99. This app is an audio course by author Melody Litton. She is a hypnotherapist, and her app offers courses on a variety of topics including aligning with your higher self, conquering cravings, energy cleansing and overcoming anxiety. The audio is well recorded, and Litton is friendly. The whole experience is just warmer and more engaging than a lot of its competition. It asks you to put your email address when you first open the app. However, this is optional, and you can just skip it and get straight to the content. Each course allows you to listen to the first few audio lessons for free. Beyond that, you need to subscribe for £3.99 per month. Though the £12.99 lifetime option seems a much better bet. The app is labelled as "Audiojoy" on your phone, which is the third party company that make the app before Litton plugs her content into it. 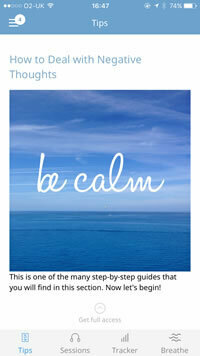 This app offers guided breathing meditations and guided journaling (where you are given topic ideas to write about). There is no free version; the paid version is £2.99. 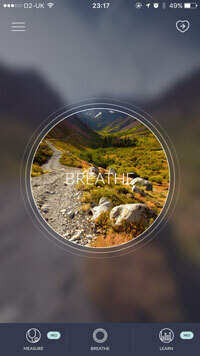 This simple and beautifully designed app takes you through guided breathing. As you hear the sounds of nature, and set on natural landscape backgrounds, it takes you through slowly inhaling and exhaling. You can customise how fast and how long you want the exercise to be. Before and after the exercise the app records your heartbeat. You do this by holding your finger over the phone's camera. Afterwards, it provides you with a breakdown of the results. This app keeps things simple: it opens with a quick instruction on not relaxing while driving and then gives you a play button. 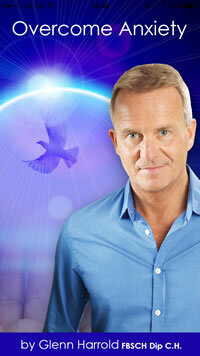 From then on you can listen to Patrick guiding you through how to self-hypnotise in 20 minutes. The audio is well produced and includes music in the background. You can purchase additional audio from the store. Each one is £2.99. Calmy is a meditation app. As soon as it opens it blasts you with the calming sound of running water. You can download other backgrounds in exchange for writing them a 5-star review. There are a tonne of meditations on here, but you need to subscribe at £19.99 per month to access any of them. There are two pieces of content you can access for free. The first is a daily quote. The second is the running water again, but this time with a timer. They also have a breathing exercise, but this is a placeholder saying "still in development" at the time of writing. This app is a series of nice pictures with some relaxing background music. That's the whole thing. And the top of it is taken up by an advert. Relieved bills itself as a depression support community. You have to put in all your personal information to register (age, height, email, location) and I didn't want to, so I can't tell you how good it is. This app starts with some dramatic music and a voice over telling you that "you can change your brain". It explains that the limbic system is the cause of a lot of our anxiety (which is true) and what it calls "the human cortex" can change that. Then it tells you that you are ready to try Limbic 321 and that you need to upgrade for £4.99 to get access to it. 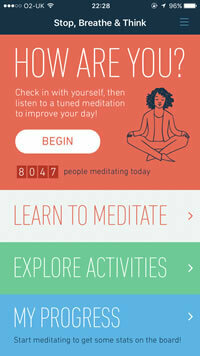 This app offers mindfulness meditations. You get a bunch of them for free and can then upgrade for £41.99 per year to access them all. It integrates with Apple Health. The free content includes a 5-day starter series and some timed sessions where you can pick between three and thirty-minute sessions. This app allows you to connect with other people looking to improve their mental health. You put in your age and what issues you struggle with and it then matches you to other people. It asks a few personality questions to get you the best match. It's a great way to connect with people. 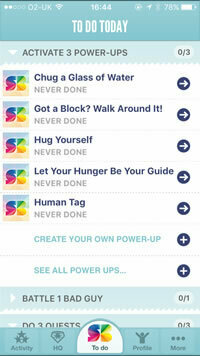 The app also features a journal system that allows you to write down your thoughts and track your mood. You can share these entries with the community if you wish. Prompt questions are provided if you are not sure what to write about. You can then read other people's entries, and "heart" them, or request that person as a penpal. This app is a meditation app. When I clicked on the "get started" button, I was transported into a video of Lynn introducing herself and the app. She does a good job of showing you each screen and what they do. You can access your first meditation immediately. After that, you need to register to access the rest of their 7-day challenge. To unlock most of the meditations, you need to subscribe. It's £6.99 per month with discounts for one and two-year subscriptions. This app offers a 25 minute guided audio. The Lite version is free and offers a British male voice. The full version is available for £2.99 and offers both male and female voices as well as a second meditation. This app offers three free de-stressing meditations. You can then buy additional audio from the store. However, there are no prices, so you have to tap the purchase and then wait for the iTunes pop-up to come up and show you the price. The interface is rather clunky. 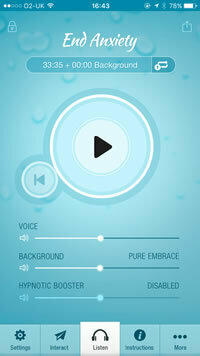 This app offers 20-minute self-hypnosis audio recording. You can configure a few settings on the audio. The basic version is free, or you can upgrade to the premium version for £1.99. This allows you to skip the instructions at the start and gives you more configuration options. 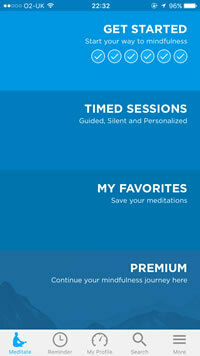 This app offers what it says on the tin: three-minute meditations. It optionally integrates with Apple Health. You get the first three meditations for free, after that you need to upgrade for £7.99 per month to get access to the rest of the content. There are also some breathing exercises and premium courses. This app offers you two options: short term relief and long term relief. If you click short term relief, you are given four tools to help stop panic attacks as they happen. These include vibrations, journaling and the sound of a cat. 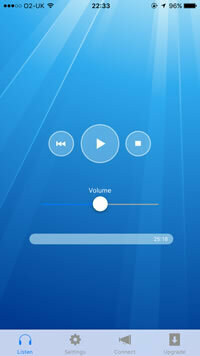 The long term relief screen gives you some guided audio sessions and text to read. The interface is very blue. Very very blue. 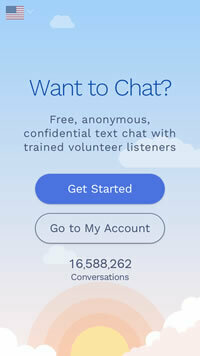 This app offers free and anonymous chat. You can register if you like, but it also lets you chat with people without doing this. When you launch the chat, you are given a list of people to pick from who it bills as trained volunteers. 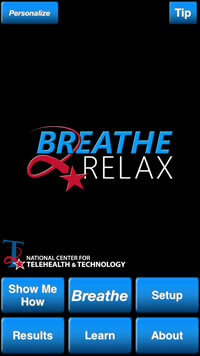 This app offers a simple breathing exercise that tells you when to inhale and exhale. The interface is clean and simple, and there is no messing about: as soon as you launch the app you can click the big start button. This app offers the industry standard GAD-7 anxiety questionnaire. The interface is clean, and it gives you a score and interpretation of that score in the end. You can view your history on a chart. This app offers a stress meter. You hold your finger over the camera of your phone. You have to do this and hold it still for two and a half minutes, which is a really long time when you are trying to do it. It then gives you a stress reading as a percentage. You can then attempt to lower your stress level with guided breathing. An animation shows you when to inhale and exhale, and you can watch your heartbeat and stress level move up and down in real time. The interface is very clear and helpful messages pop up all of the time to explain what is going on. The first five times you do the exercise are free. After that, you need to upgrade to the pro version. This costs $12.99 per month or $79.99 per year. This app gives you a daily meditation which in this case consists of a sentence suggesting something like "reflect on 3 things you are grateful for" or "you will die some day, how are you living today?". You cannot fault them for the content: it gives you exactly what it says on the tin. For the free version, you only get seven days of content and then it looks around again. For new content, you need to subscribe for £4.99 per month. 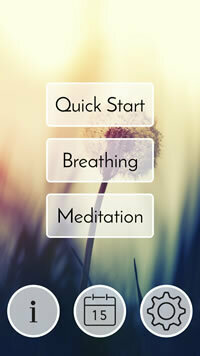 This app offers a simple guided breathing exercise. 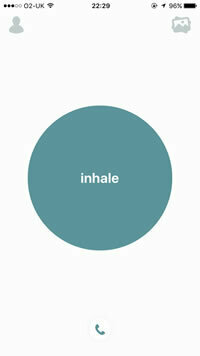 As soon as you open the app, you find a circle moving in and out telling you to inhale and exhale. You can pick your colour scheme, but that is it: simple and elegant. 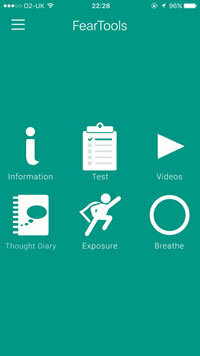 This app offers a toolkit of useful features: information you can read, a test, videos, a thought diary and a guided breathing tool. The information to read is maybe ten paragraphs. The test is the GAD-7, and you can see your test history. The videos section links you to the YouTube app. The thought diary allows you to add entries like a notes app. This app offers a mood tracker and a range of meditations. Everything about this app is beautifully designed. The interface is lovely. It will teach you how to meditate before giving you a practice session, It allows you to track your progress and integrates with Apple Health. You get the first few for free meditations of each section and then need to upgrade to unlock the rest. This adds up to quite a considerable amount of free content. If you want to upgrade, this costs £9.99 per month or £54.99 per year. This app starts with a video about what is stress and then gives you some text and video exercises to follow along with. The interface is very clunky. It is slow and based on my phone's data processing, looks like it is just loading in web pages. I had to click buttons several times to get them to do anything. The videos themselves are well produced. You can access the basic version for free to upgrade to the pro version to upload your own audio and customise the app. This is a one-off purchase of £5.99. 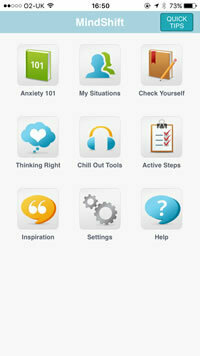 This app offers a digital pill to reduce stress and help you relax. In practice, this means guided audio meditations. You get the first one for free and then you can buy the other audio "pills" for £3.99. You can purchase them from the pharmacy tab, and the selection includes help with sleep, confidence, creativity and concentration. You can subscribe to get access to everything. The meditations themselves are around half an hour long. 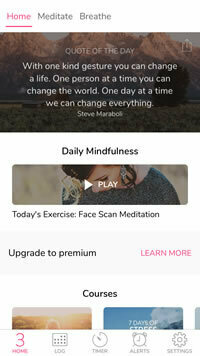 It integrates with Apple Health to record your mindful minutes. 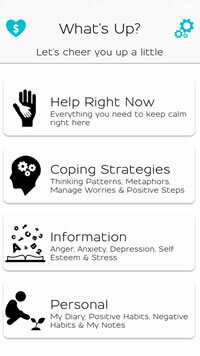 This app bills itself is "simplified CBT for stress and anxiety" and is a toolkit app offering a variety of things to do. This includes two mindfulness meditations, a workbook that helps you to reframe thoughts and the ability to create flashcards. 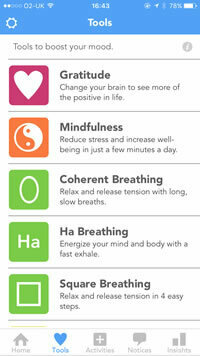 These are really useful for helping you calm yourself down (I discuss it in my book Technical Anxiety - just saying). You can even add an image from their library or your camera roll to go with each card. The app's design is beautiful. Everything is well designed and nicely animated. It has clearly had an excellent designer work on the look and feel. The interface looks good and feels smooth. 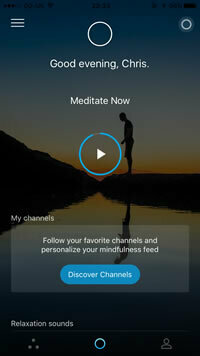 This app offers guided mindfulness meditations. You get a couple for free, and you can upgrade to get access to over 1,000 additional ones. This costs £88.99 per year. You have to register before you can access any of the content. 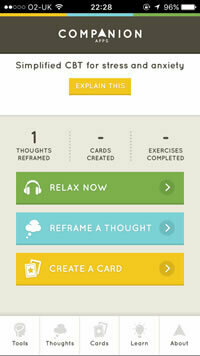 This app offers a course in mindfulness. You get access to the first two levels of the course for free (you need to register first). To unlock the full course, you need to subscribe. This costs £6.99 per month or £29.99 per year. 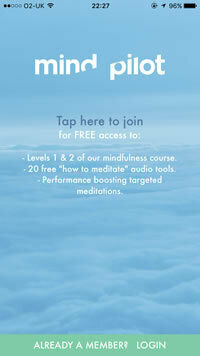 This app offers guided audio meditations. The exercises are broken down into sections (introduction, exercise, afterword) and the instructions are clear. You get the first 6-minute session for free. After that, you have to pay to unlock each of the four levels, priced at $4.99 for the first one and $7.99 for each additional one. It's well-designed and simple to navigate around, making it a pleasure to use. The iOS app market for anxiety has exploded in the past year or two. There used to be a few dozen apps out there. Now there are hundreds. In fact, this guide is far from exhaustive. I just had to give up eventually because there were so many. However, I think I have captured the most visible, popular and important ones. Despite the number of apps, the range of things they do is limited. Most use the same model: they are based around offering mindfulness meditations and give you a couple for free before asking you to pay for the rest. Which apps are my favourites? For meditation, Headspace is a good option. It is the only one I have managed to stick with for more than a month (though I have now given up on it, too). I like the different packs it offers as they offer something a little more focused than general relaxation. For toolkits, I like Companion's tools. They are limited but do what they need to. Pacifica looks interesting, but I have not been able to motivate myself to go in and do the exercises. For breathing, I like the simplicity of BeOkay, and I like the interface and breathing pattern of Hear and Now. 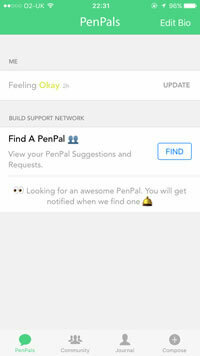 The other apps I would recommend are the GAD-7 test if you are looking to track how your anxiety goes up and down, and Stigma id you are looking to expand your digital friendship circle. Published 3 July 2017. Written by Chris Worfolk.